Grace Temple Baptist Church was organized in October of 1940 by fourteen people and Pastor Virgil H. Fisher. The church was then located on the corner of Sunset and Tyler in Oak Cliff, just one block south of the present church location. On February 16, 1941, Buel R. Crouch became pastor of Grace Temple. From the beginning, Grace Temple experienced rapid growth and expansion. On March 7, 1947, the members marched as a group from the old building to the new location here at the corner of Tenth and Tyler. Grace Temple continued to grow and needed more space. In February of 1954, an educational wing was added to the church. In 1962, a Day Care Center was started and cared for more than 150 children. God continued to bless Grace Temple, and within a few short years, it was determined that a larger sanctuary would be needed. 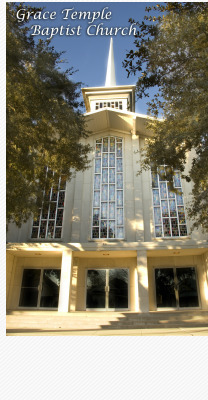 The new sanctuary was built and dedicated on February 10, 1966 with a seating capacity of 1,440. In just 25 years, Grace Temple had grown from a single frame building to facilities which now occupy nearly a city block. Due to health problems, Brother Crouch announced his retirement on October 10, 1973. It became effective on his thirty-third anniversary with the church, February 17, 1974. Douglas L. Laird came in 1974 and under his leadership, the church pledged the needed amount to pay off the final building. This occurred in 1982. Throughout the 1970’s and 1980’s, Oak Cliff was in transition. Yet, no matter what the community looked like, Grace Temple refused to abdicate its God-given mission to be a lighthouse on this corner and to minister God’s love to this community. The church became smaller in those years, but the ministry never stopped. In the fall of 2008 under the leadership of Pastor Ryan Jespersen, the church went through a process of fasting and prayer. Since that time, attendance has begun to steadily climb. The church has begun a ministry to Spanish-speaking people. God has continued to work, and the next 70 years, though certainly different, look bright. We are trusting in the God of this universe who has never failed us. Marco Castillo was called as Senior Pastor on July 28th 2013.